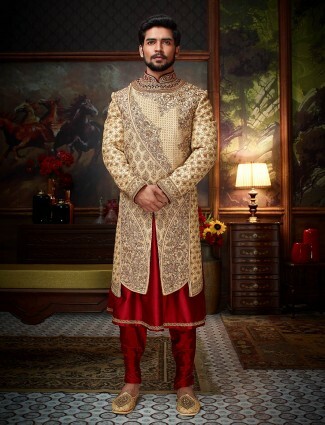 Bespoke collection of Mens Wedding Sherwanis and Groom Sherwanis is what we possess as wedding elegance for men At G3+ Surat, Ghoddod road Store you can find all the latest styles of fabrics and designs of mens sherwanis online. 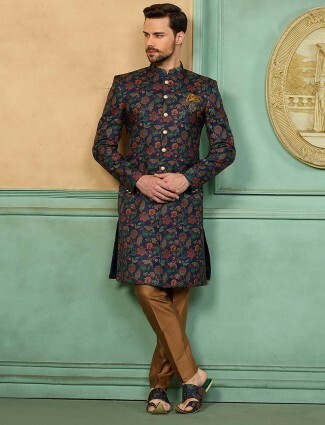 When it comes to a Wedding occasion, men will find their best time to put on a Sherwani. 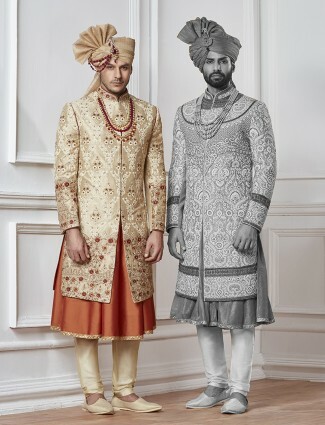 Despite of the new changing trends in Indian fashion, men would still love to carry a Wedding Sherwani for wedding occasion as a groom or groomsmen. 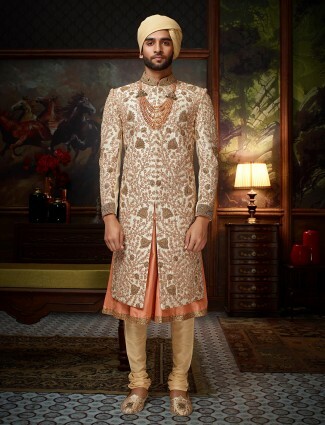 Today we find designers are busy reviving old tradition and old craftsmanship of heritage India, the trend of Royal Sherwanis or Achkan Sherwanis are still on trend for the new men today to look stylish yet in authentic Indian style. 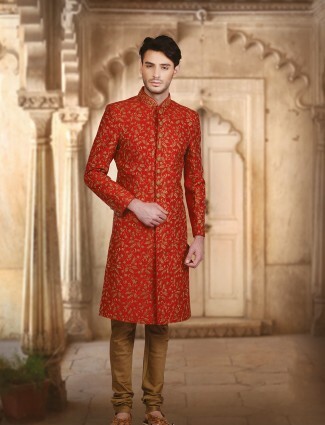 We at G3fashion bring you some of the most exclusive range of sherwani collection online. 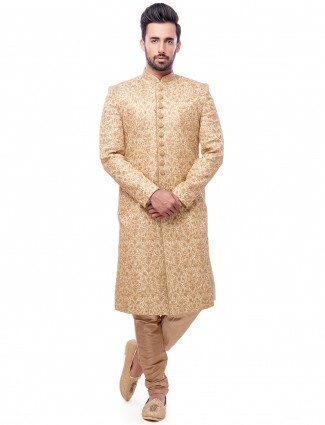 You can find best wedding sherwani for Grooms, Groomsmen or to wear as a Wedding Guest too. We have seen the old embroideries and textiles finding their way back in fashion today, thanks to fabulous designers for making that possible by designing such concepts in Indian Wear. 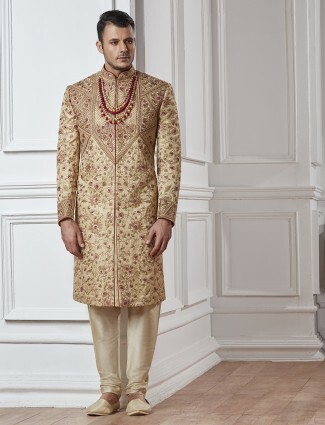 The Indian wedding sherwani then had beautiful textile weave fabrics and embroideries. Now we see such intricate embroideries like Kolkati work, Lucknowi work, Kashmiri work sherwanis for grooms. Whether they work in on weave fabrics like Banarasi silk, or the Traditional Pattern of Royal and Rajasthani Sherwanis or in a wedding sherwani pakistani style. 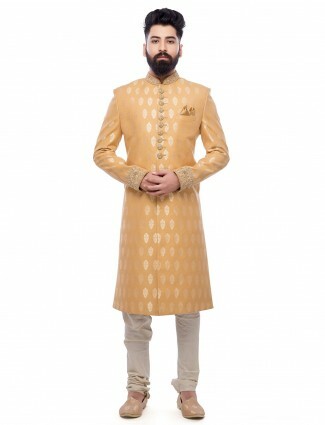 At G3fashion.com Dulha Sherwani Collection available online for Grooms to be, who have their personal choice of those Traditional Sherwanis or for those designer sherwani for grooms. 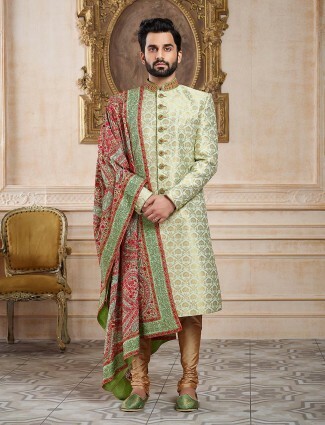 You can come across our website to find different sizes from 38 to Plus sizes sherwanis for men. We also customise fittings in sherwanis to give our customers the best online shopping experience. Choose from latest sherwani design for marriage functions, sherwanis for groomsmen, sherwani for engagements and more in different patterns. 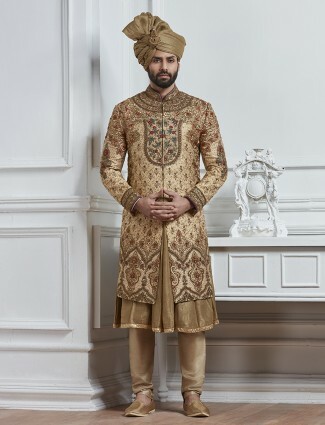 Go for Punjabi Wedding sherwani which consists of a Jacket of Knee length with exquisite embroideries and also in new pattern of front opening designs. Choose Anarkali Kurta Sherwani styles, Short Jacket sherwani or Jodhpuri Sherwani which are much in trend for modern grooms. 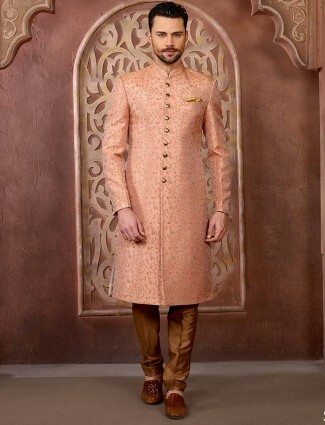 Also find Sherwani Suits for wedding online at G3 Fashion which are in short Bandhgala Sherwani with Pants. Go all Traditional with Dhoti sherwani designs which can be worn also for Pooja ceremonies or Receptions. 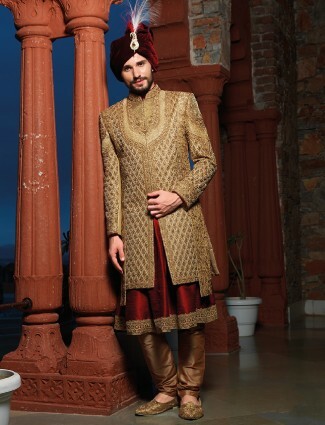 We bring the best wedding sherwani designs from all men to look best for their occasion. Our Fashion has always been up to the mark with Celebrity fashion for men as well. 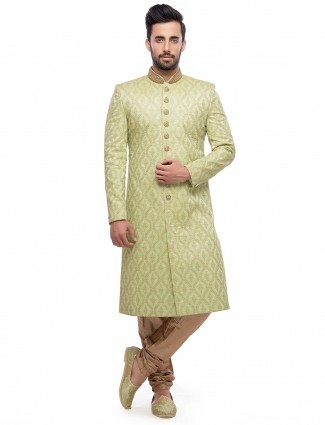 Latest sherwani designs for wedding like Bollywood Actors is also available for online shopping sherwanis at g3fashion.com. Designer like Sabyasachi have just hyped up the trend of those Stunning Black sherwanis for wedding, though you may not want to wear it for your main ceremony, you can always opt it for a sangeet or Reception party. The Exclusive Black sherwani in Thready work or a Black Banarasi Weave sherwanis. 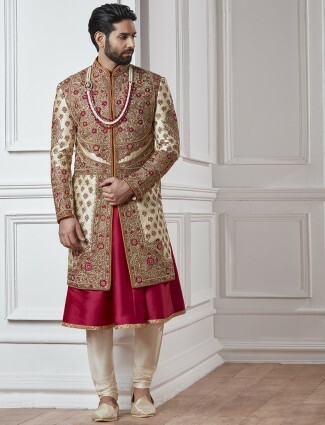 Manish Malhotra sherwani styles are perfect to style for Sangeet, Cocktail hour, Reception or even you Wedding ceremony. From Pastels and blue sherwani for wedding to Minimal Work concept sherwani, Manish Malhotra has set the trend for men to sizzle in sherwanis. 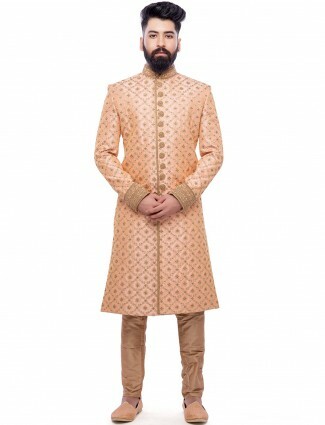 Our sherwani collection has all those designs as well as the indo fusion styles of Kurta sherwani style to the Short Jacket sherwani suits are just right on trend for all men who wish to look dapper in a wedding sherwani. 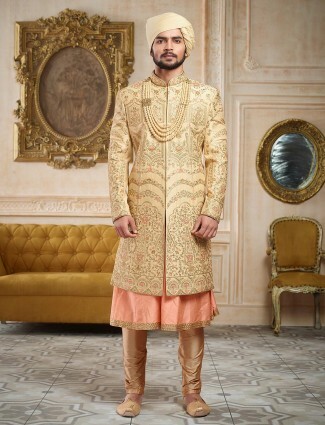 We display some of the best wedding sherwani online collection with modern twist or with a traditional glam or just with some bollywood sherwani drama. 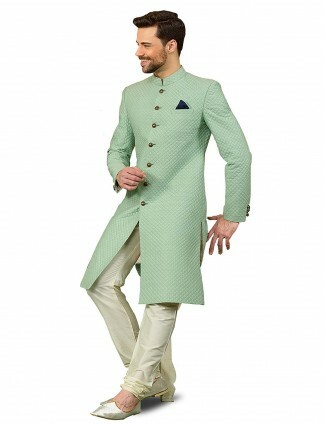 Wearing a G3fashion.com Sherwani would give you a perfect look for any occasion. 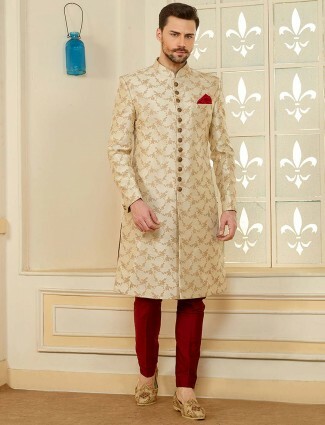 Shop for pastel sherwanis like Virat Kohli, or go all Traditional Like Ranveer singh in a Red sherwani in Banarasi silk, try his subtle look of white work sherwani which he wore for his Reception or just try the Solid color Sherwanis with a side button opening or asymmetric opening. Shop online sherwanis from g3fashion to explore from a wide range of different bottom types with sherwanis and different types of pattern of hemline, collar or opening. 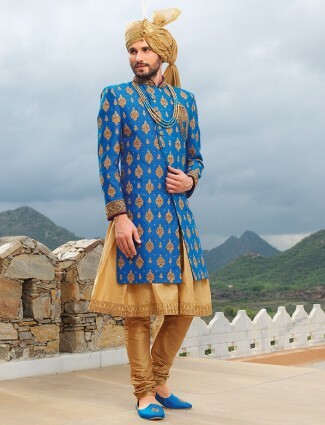 Paired as a 4 Piece sherwani with a kurta, Jacket sherwani, churidar and sherwani dupatta or a Waistcoat or Nehru Jacket, Kurta, churidar as a 3 piece wedding sherwani for men. Go all traditional with Mughal Sherwanis or Achkan and Angrakha style sherwani which are easily available in new embroidered concepts at G3 Fashion in all colors of Gold, cream, red, maroon, Green, orange. 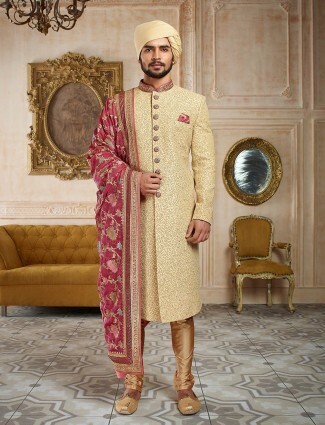 Or choose modern color sherwani in Pink, Magenta, Yellow, Black or Blue sherwanis for men.